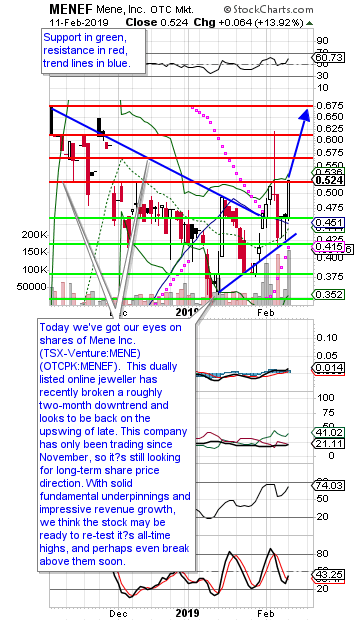 Today we've got our eyes on shares of Menē Inc. (TSX-Venture:MENE) (OTCPK:MENEF). This dually listed online jeweller has recently broken a roughly two-month downtrend and looks to be back on the upswing of late. This company has only been trading since November, so it’s still looking for long-term share price direction. With solid fundamental underpinnings and impressive revenue growth, we think the stock may be ready to re-test it’s all-time highs, and perhaps even break above them soon. Before we get much further into this technical only review of the stock, we would likely to highlight that we will be reviewing U.S. listed shares (MENEF) in this article. Secondly, our data provider has the stock name listed as Amador Gold Corp, however the company name is in fact Menē Inc.
As mentioned off the top, the stock has caught our attention because of its recent downward trend line breakout, which occurred a bit over a week ago. Since then, shares have been moving higher as seen by a new upward trend line we’ve annotated. Today shares rallied an impressive 13.92% on an overall lacklustre trading day for the overall markets. If that was not enough, this close to 14% pop in the stock price was also on the highest volume day the stock has ever had in its relatively short three-month trading history. Add it all up and it appears that the stock is looking poised to re-test its November highs, and may even be ready to break above them. When stocks have a limited trading history, support and resistance levels are not yet fully developed, however we are starting to see specific levels to watch for on the resistance and support sides. Looking at resistance levels, the stock currently is resting on a key one ($0.52) with today’s close. Yes, it’s slightly above it, but not far enough to consider it a support level yet. Further resistance looks to be at $0.56 and $0.61 followed by the all-time high at $0.672 which was printed on its first day of trading in early-November. While we like the potential of a blue-sky breakout for this trade, we will go the conservative route and look for a price target at $0.67 for this trade. As for support, we would watch the $0.46 level to act as immediate support on any near-term pullback followed by more at $0.41 - $0.42 level. Below that, support would also likely be found around $0.38 and $0.34 - $0.35. For this trade, we would look to place a stop loss at $0.44 as any further downside past this level would likely mean a resumption of the previous downtrend. This one is a tough one from a technical perspective. Typically, it isn’t wise to buy on resistance, however in this case with the levels still not well defined because of a lack of trading history and the fact that today’s trading was so strong on impressive volume leads us to believe that this stock likely will continue to head higher in the coming days and weeks. As such, we would be comfortable with an entry at these levels. Because on today’s closing price ($0.5239), our upside potential looks to be 27.9% while our downside risk is limited to 16%.